Indonesia is home to 521 natural lakes and about 100 reservoirs, covering an area of approximately 21,000 square kilometres (km²). The total volume of water held across the country is approximately 500 cubic kilometres (km³). The largest lake, by both area and volume, is Lake Toba in Sumatra. It holds about 240 km³ of freshwater, and is the largest lake body in Southeast Asia. Lake Toba is an immense volcanic lake covering an area of 1,707 km², making it even bigger than Singapore. In fact, Lake Toba is so big that it even has its own island at the centre of it. Lake Toba spans seven regencies in the province, including Humbang Hasundutan, Toba Samosir, Karo and North Tapanuli. Formed by a gigantic volcanic eruption some 70,000 years ago, it is probably the largest resurgent volcanic crater on Earth. The picturesque Lake Toba, is among the many new priority destinations in the country’s national strategic tourism plan, which was launched recently by the Indonesian government. Some of the other priority destinations include Borobudur, Central Java, Mandalika, and West Nusa Tenggara. However, the symbolic Northern Sumatra Lake continues to be blighted by extreme water pollution. In all unfortunate reality, Lake Toba is not the only lake in Indonesia facing this fate. According to the Indonesian Environment Agency, Research and Information Technology (BALIHRISTI), 17 other lakes in the archipelagic nation are already classified as being in critical condition. These lakes are experiencing a multitude of environmental problems including pollution and sedimentation that is causing them to shrink. One clear example is Lake Limboto where deforestation in the nearby mountains is causing the lakebeds to rise due to sedimentation which increases the risk of flooding in the surrounding areas. Further reports by researchers from the Research Centre for Limnology, Indonesian Institute of Sciences and International Water Resources Research Institute have predicted that the lake “will cease to exist by 2025” meaning that the continuous shrinking of Lake Limboto will soon result in its disappearance altogether. Not only Indonesia’s lakes, but lakes in other Southeast Asian countries are also being affected by pollution. The report also added that factors such as increased populations, urbanisation, deforestation and the caged fishing industry have severely affected water quality of these lakes. Another example is lake Tonle Sap in Cambodia which is a UNESCO World Heritage Site and supports the livelihood of over 1.2 million people in the country. This important lake is also under threat of pollution as well. Laguna de Bay, the largest lake in the Philippines is located east of Metro Manila. It is another Southeast Asian lake undergoing massive pollution because of untreated domestic waste dumps. The pollutants found in the lake water here are in the form of xenoestrogens, a foreign substance or mixture that can alter the functions of endocrine organs in fish. According to Fisheries Statistics in the Philippines, Metro Manila alone produces about 125,902 metric tonnes of fish annually. This means that fishing contributes largely to the local economy and serves as a source of income for many locals. Apart from threatened income, the region’s tourism industry will also be negatively affected by the degradation of its lakes as tourism is a large contributor to the economy of these countries. Moreover, as most of these lakes are also a source of drinking water, polluted and scarce amounts of drinking water will heavily impact the health and general well-being of the human population. Other fears include flooding that might threaten towns and cities as these large lakes act as basins. This means that if a lake shrinks, rainwater will overflow into the surrounding areas. How can the region solve this problem? 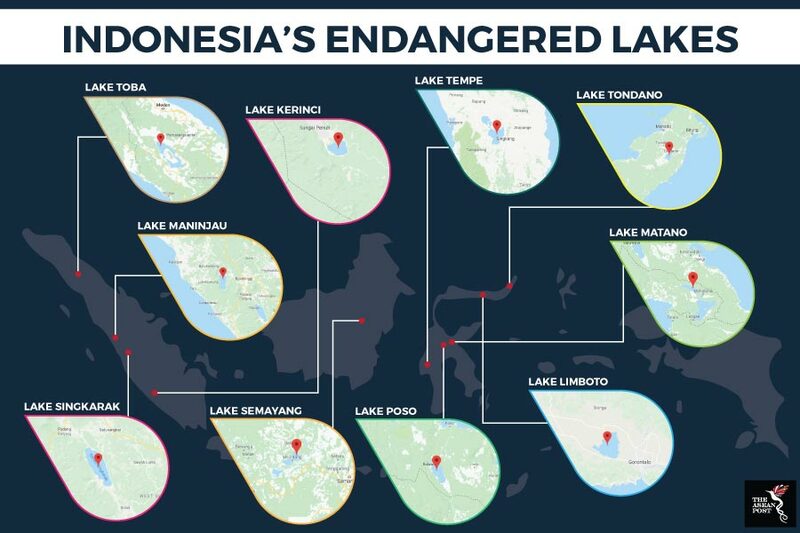 Late last year, the Indonesian government came up with the ‘Limboto Declaration’ to save the country’s endangered lakes through a national body which is to be confirmed. According to the report, district heads and academia hope that “the discussion will result in a final meeting with President Joko “Jokowi” Widodo to create the Archipelago Lakes Regional Forum (the tentatively named Forum Daerah Peduli Danau Nusantara) to help clean up and conserve all the lakes in Indonesia. Other countries in the region should follow suit by making the well-being and preservation of their lakes a priority. The pollution of these great lakes clearly has a lasting effect on the environment and society in general. A report by the Global Water Forum suggests prevention and monitoring as two steps in order to rehabilitate polluted water sources such as lakes. Southeast Asian countries like Thailand and the Philippines are already implementing laws to prevent pollution and to protect receiving waters. In terms of monitoring, “respective countries require collaborative management as well as improved and effective water quality management strategies including analysis, and sharing of accurate data for further solutions,” the report stated. This article was first published by The ASEAN Post on 16 January 2018 and has been updated to reflect the latest data.